Death Cab For Cutie haven't really flinched since 2008's 'Narrow Stairs', the album was critically acclaimed and with the inclusion of their song 'Meet Me on the Equinox' as the lead single to be featured from the second Twilight film 'New Moon', the band managed to skyrocket into the mainstream whilst still maintaining their indie ethos, a statement that is proved by them opening up tonight's set with the unlikely 'Bend to Squares'. 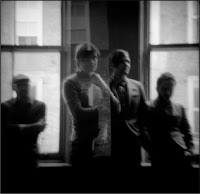 The band hold no bias to any particular albums and showcase a range of their back catalogue, including deep-cut 'Portable Television' from this year's newest release 'Codes & Keys' as well as the inclusion of the 'We Laugh Indoors' which was thought to have been lost in their discography. New material such as title track 'Codes & Keys' as well as 'You Are A Tourist' (the latter in particular) get an overwhelming response from the audience. It's incredible that with 7 albums under their belt, this band still manages to still please audiences across the world. Being sandwiched in the middle of the set, Ben Gibbard picks up an acoustic guitar and reflects upon storytelling and what it means to him before performing 'I Will Follow You Into The Dark' which is met with constant swaying and singing along from the crowd. A personal highlight of the night is 'Stay Young, Go Dancing', Ben Gibbard's meloncholic guitar provides a poetic backdrop for his lyrics to overlay. The band exit the stage after playing the upbeat 'The Sound of Settling' but are quick to return, itching to perform 'Transatlanticism', a track that is so ethereal and captivating that the entire audience is under the allure of Gibbard's haunting piano alongside Chris Walla's guitar responding with sparse and repeated slides. When the sound explodes, it explodes and when the momentum of the song reaches it's peak and it suddenly feels like there's no way the song could possibly get any huger without turning the volume up, Gibbard messes around with his vocal effects to extend the song for as long as he possibly can, his voice echoing around the belly of the beast that is Rock City.